The finished frame for my next sculpture. Every element has been sculpted and fabricated by myself. Referring to Gothic design and ornament, I was striving for a reliquary feel. This will be my largest piece, with a standing height of 3' 10". Originally titled "All Horizons Lost, Flesh Forever Found", the center imagery of the piece has undergone so many changes I am renaming the sculpture. It will be now called "Beneath the Remnant Veil". I am working on the new bronze title plate at the moment. 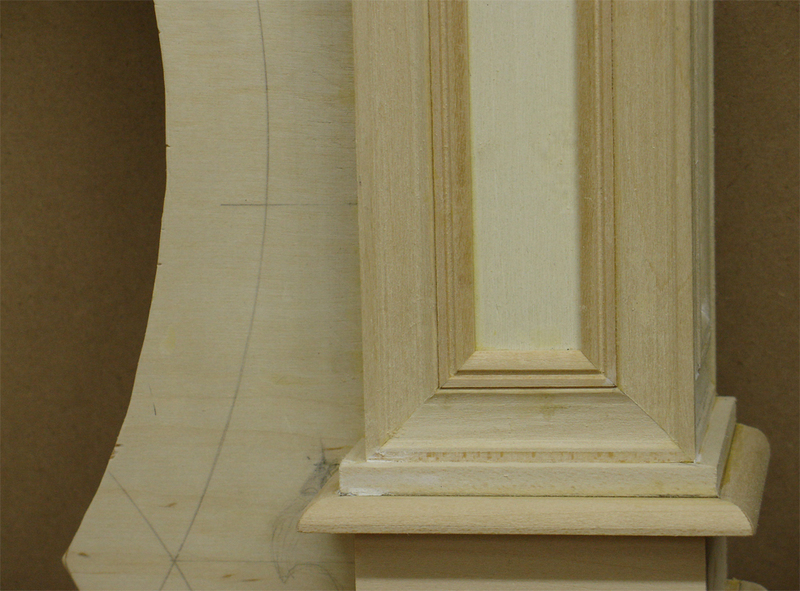 The top of the frame for "Beneath the Remnant Veil". The frame's under structure and basic paneling. 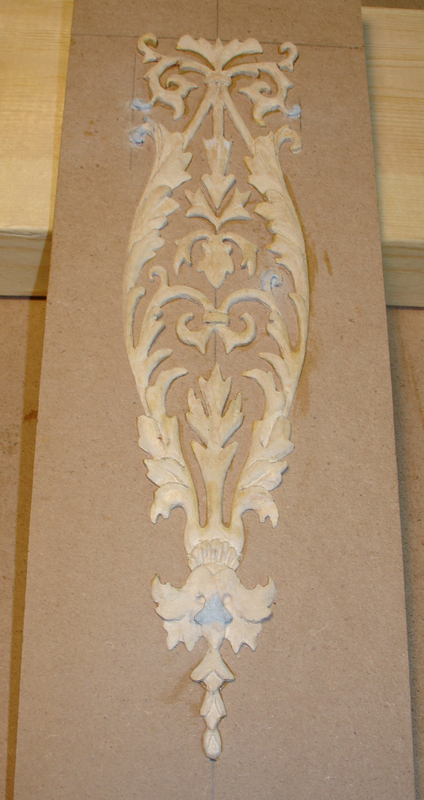 A Basswood carving for the front lower panels. 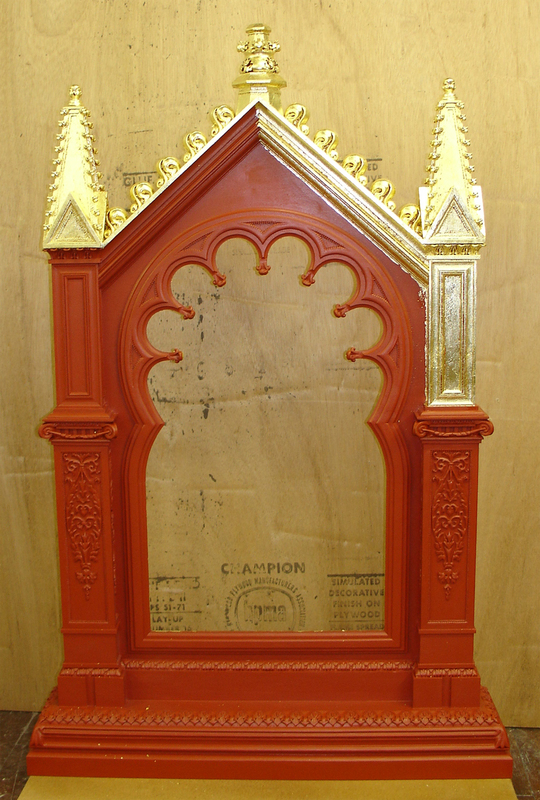 The frame with all of the ornament on, as well as the red bole, starting to be gold leaf gilded. 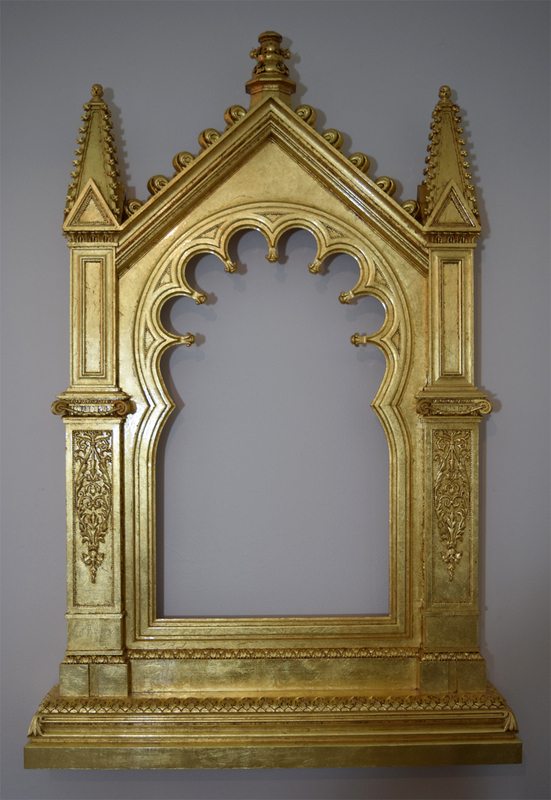 The finished gilded frame. The gold leaf has been toned down with a thin layer of oil paint, and clear coat applied. 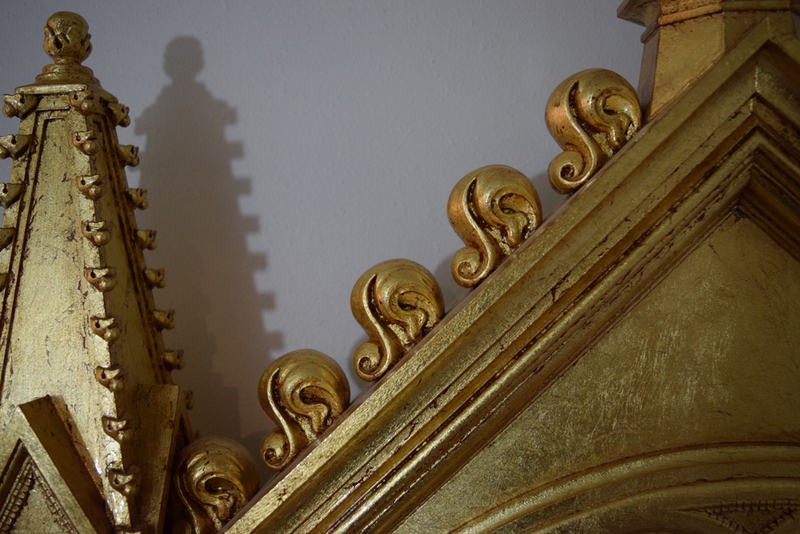 A detail of the frame's bottom ornament. Detail of the front panel ornament. Detail of the side panel ornament. Detail of a column top. Detail of the top tracery of the frame's opening. Detail of side top spires with small crockets. Detail of the top crockets. 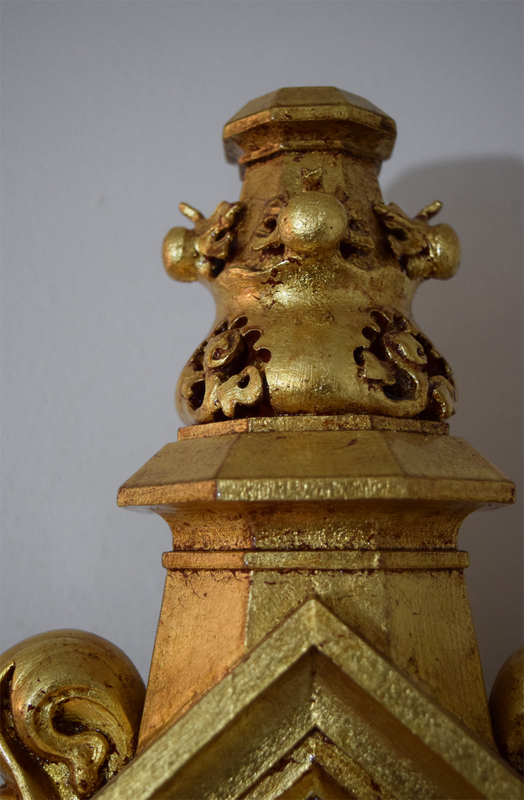 Detail of the top finial. Several hours of gilding later, the base for the upcoming sculpture, The Ephemeral Knot, is finished. In a few days it will go to woodworker Ed Wohl, who is always kind enough to help me with the clear coat finish work. 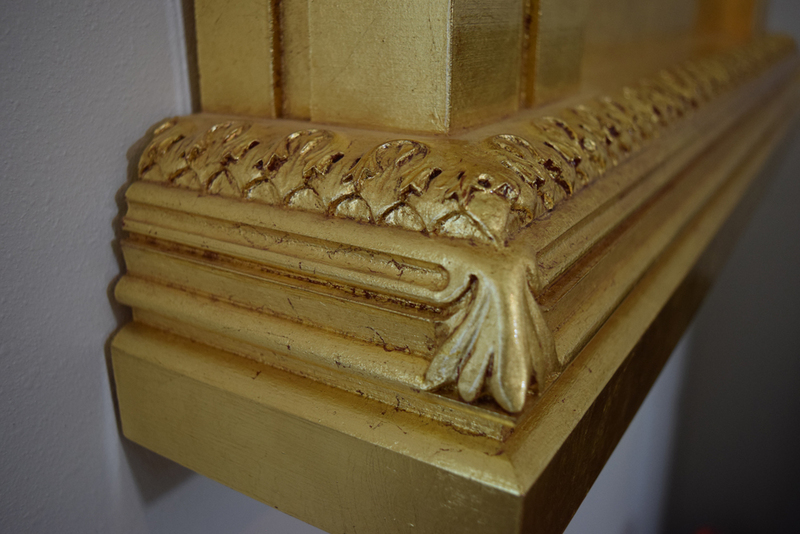 Detail of the finished gold leaf base for The Ephemeral Knot sculpture. The finished red oxide base coat. The finished gold leaf on the underside of the base. Applying the gold leaf to the top of the base. The first of the gold leaf sheets to be laid into the base ornament. The finished gilded base, less a gloss clear coat. 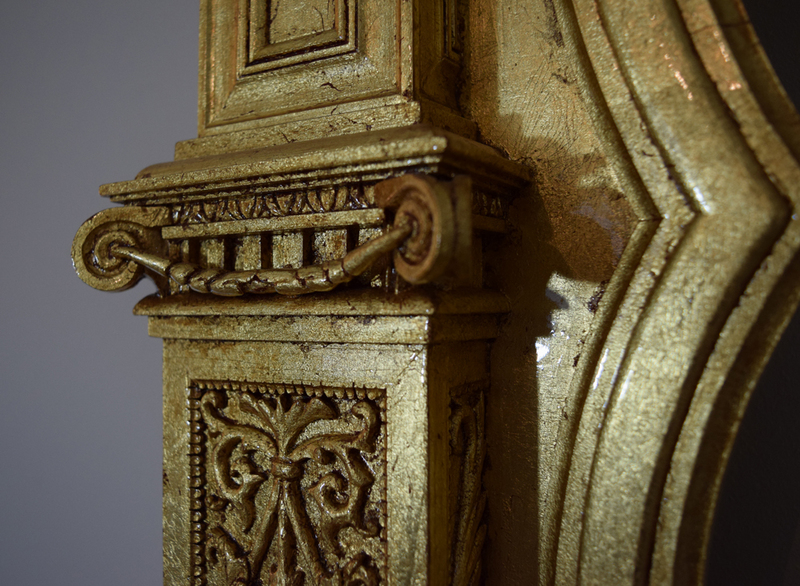 Detail of the gilded base and ornament. The primer and color layers being added to the base for The Ephemeral Knot, prior to gold leaf. Traditionally, the red oxide colored layers would be a clay bole. Instead, I use an acrylic for durability. The base will finally be ready to gold leaf this weekend. Detail of the bone ornament, it still needs a few more layers of paint. The base in progress for The Ephemeral Knot. Detail of the corner ornament in progress. The Ephemeral Knot Plates Finished. The front title plate took me three tries to get a good casting, but the bronze title and name plates for the upcoming piece The Ephemeral Knot are finally done. On either side of the plates are castings of human finger bones, specifically that of a fourth proximal phalange. The bronze has been heated in a kiln up to 1100 degrees, which gives it a black patina. This is then rubbed off in areas to get back to bronze. I applied the final coats of protective finish yesterday. The bronze title and name plates for The Ephemeral Knot. 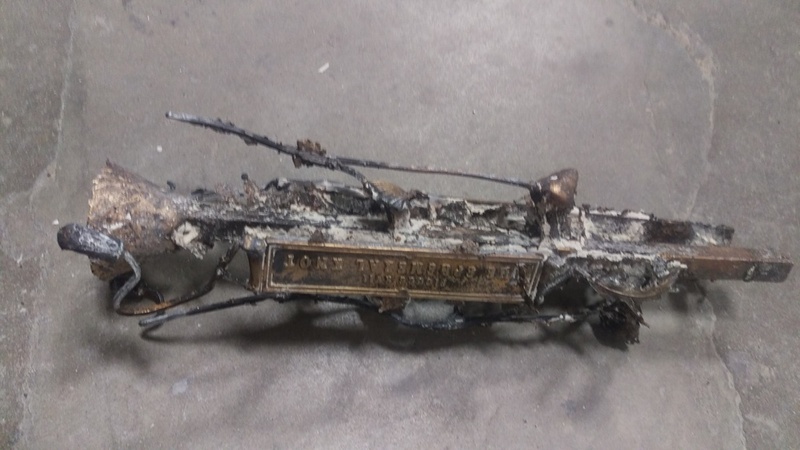 The third casting for the title plate, just out of the mold and still on the sprue tree. Finally something I could work with. The cleaned up and sand blasted plates in the kiln, waiting to be heat treated to 1100 degrees. The final bronze plates. The heat patina has been rubbed away for highlights, and the protective clear coat is finished. 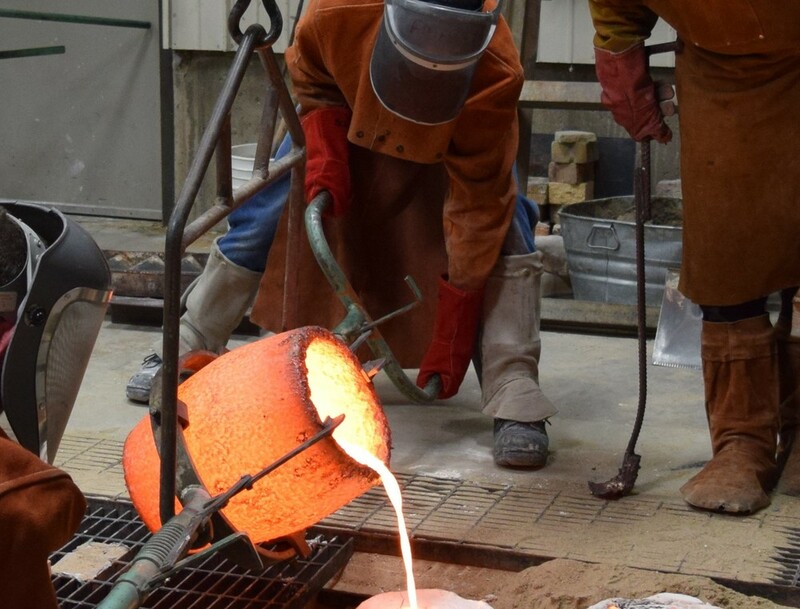 Below are pictures of the last bronze pour at the University of Wisconsin foundry. I poured my investment mold for the title plates of The Ephemeral Knot, and All Horizons Lost, Flesh Forever Found, as well as a few other waxes for future pieces. Observing this time was a group from a local high school. Setting up the molds with the pour team. Practicing the pouring order of the molds. Sculptor and Art Metals instructor Peter Flanary loading the forge with bronze. Take a look at his work HERE. Bringing the bronze crucible out of the forge. A group from a local high school was observing. The pouring of my investment mold. Pouring other artists' investment and sand molds. The remaining bronze is poured into ingots. I wanted to share more pictures from the last bronze pour at the University of Wisconsin Foundry. Two of the investment molds were my own, the rest belonging to other artists. The investment and sand molds waiting in the sand pit. The forge heating up with bronze ingots. Myself with the rest of the pour team. My two investment molds. The blackened charring around the large one in typical, due to the large amounts of wax that was melted out. Myself cleaning sand off other artist's molds. Bringing the crucible out of the forge. I'm working the left side. The crucible is lowered into the cradle and the crane is attached. The crucible is slowly guided over to the sand pit with the molds. Pouring the first mold, which happens to be mine. This is the largest mold that I have done and it was very exciting to finally get metal into it. The pouring of my second mold. The remaining bronze is poured into ingots. About this time I was unbelievably hot. The heat radiating off the crucible and molten bronze is incredible to feel. Foundry Wax and Investment Work for "The Ephemeral Knot". This will be my largest bronze sculpture as of yet, although there are larger ones to come this year. The brush on rubber mold with plaster mother mold worked beautifully, and I got a usable model on the first wax pour. The mold is going to be poured in bronze soon, and I'll be heading into the foundry this weekend to see how the piece looks. The brush on mold of the arm sculpt with a two part plaster mother mold. Filling the mold with wax. The wax arm next to the original clay sculpt. 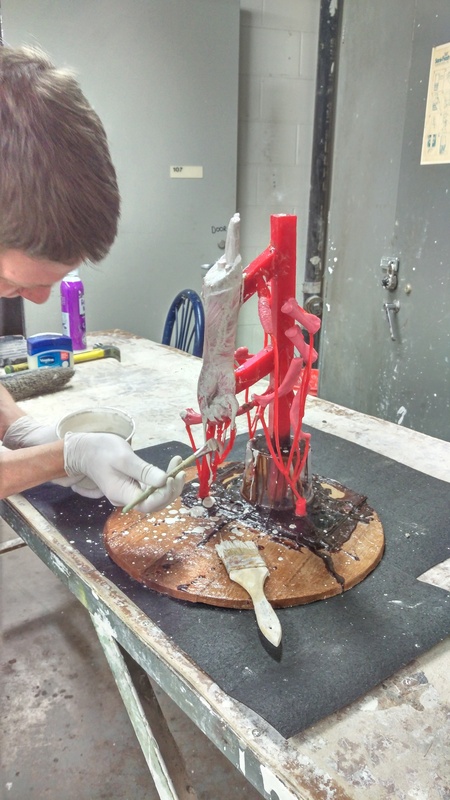 The wax arm is touched up and attached to a wax sprue tree and pour cup. Putting on the detail coat of plaster and sand investment. The main clay sculpt for the upcoming bronze, The Ephemeral Knot, is finished. The completed piece should invoke the wax anatomical models of Museo di Storia Naturale "La Specola" in Florence, Italy, which I was fortunate enough to tour. The piece is a not too subtle reminder of childhood mortality. The obviousness is hopefully excused- for with classic form comes classic symbolism. The next step is to make the mold for the investment wax. Gratitude goes to Rebekah and Leif Hansen, for allowing me to life cast their daughter Nova's hand and arm. And thank you, Nova.